Today I bring you a rather different autumn card. 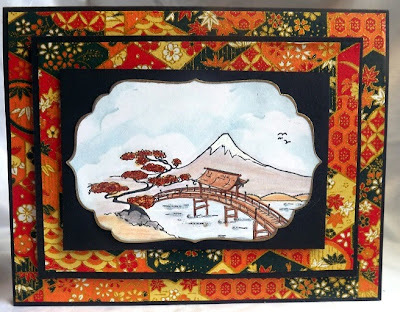 I used J97 Asian Scenery to help me create this simple Japanese style card. 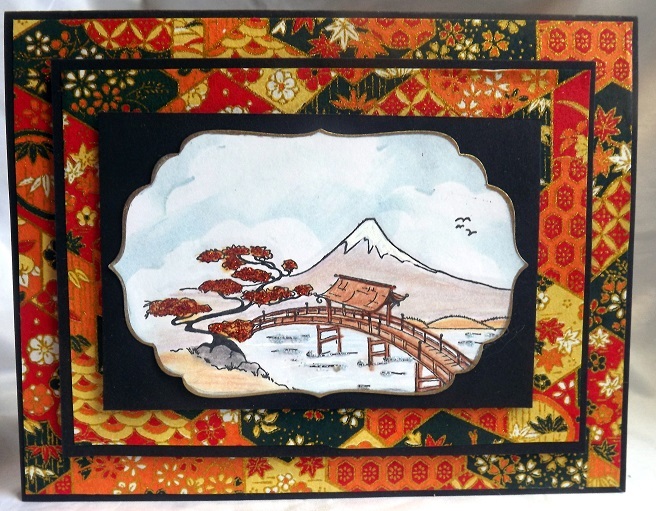 This lovely Asian landscape was colored with colored pencils and odorless mineral spirits. This is my favorite way to color up a card and one I almost always use. The cloud filled sky is chalk inks sponged around a cloud shaped template. I added White paint pen to create the snow cap for Mt. Fuji as well as ripples in the water. The Tree is given sparkle and dimension using stickles. Since this gorgeous stamp can stand on it's own and Japanese art is usally very clean and simple I did not add any embellishments to the card. Don't hesitate to check out our shop where we have a number of wonderful Asian stamps. The papers you choose really adds to the oriental flavor of your card Mary Anne. Nice job! Mary Anne, your card is gorgeous! The colors are so beautiful! Celebrating our new look with some Blog Candy!! September Challenge, Winners, and a Sale!